Why is Nothing being Marked as Spam? What Does SPF Mean and What Is It Good For? How do I Use Icewarp as my AntiSpam and AntiVirus Gateway for MS Exchange Server? How do I Re-build the Anti-spam Database? A local Domain is being used to send spam to the server. By Default users will be defined to use, or not use, the spam folder by the Anti-spam Engine default settings. It is possible to set these settings at an individual level by following the below steps. Go to Domains & Accounts -> Management. Select the user whose spam settings need to be modified. Click on the Options Tab. 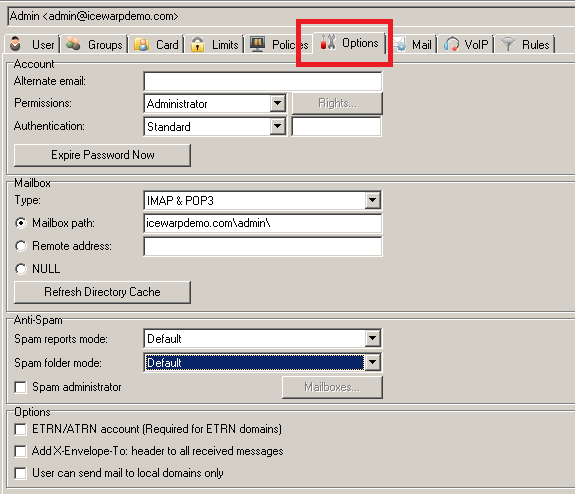 By using the drop down list next to Spam folder mode the following options can be chosen. User will use the default antispam settings.